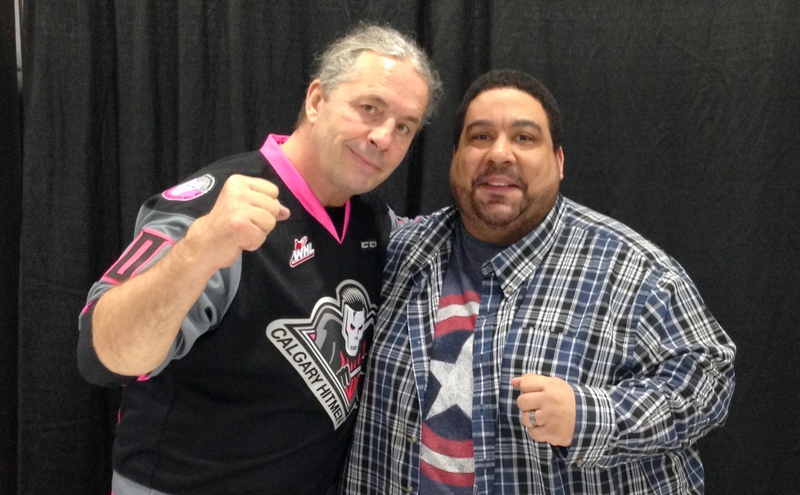 Bret Hart is my all-time favorite wrestler and he was my inspiration for trying my hand at professional wrestling. The “Hitman” appeared at a pop culture convention last weekend and I was offered press credentials to cover the event. “I just wanted to say that I’ve been a big fan of your work for many years” I uttered with bashful trepidation as I approached the table and handed him a copy of his book to sign. “Well, thank you. I appreciate that” Hart responded with a quiet tone that bordered on shy, and had difficulty making eye contact at first which surprised me considering he is a superstar known the world over. I didn’t take offense to it in the slightest because I also have trouble making eye contact. In fact, I’m terrible at it, even when I’m face to face with someone. The thing is, I wanted this meeting to be different. So, I looked him right in the eye and complemented him on the well written detail in his book and asked if he had taken notes over the years prior to writing it. Hart’s shoulders became relaxed and said he kept a tape recorder with him to document various moments throughout his career because he knew he would write a book one day and wanted it to be as honest as possible. At that point he was comfortable conversing with what to him was just another fan as he looked me right in the eye. Bret has gone on record stating that his 1992 match with the British Bulldog at Wembley Stadium was his most memorable affair inside the squared circle. 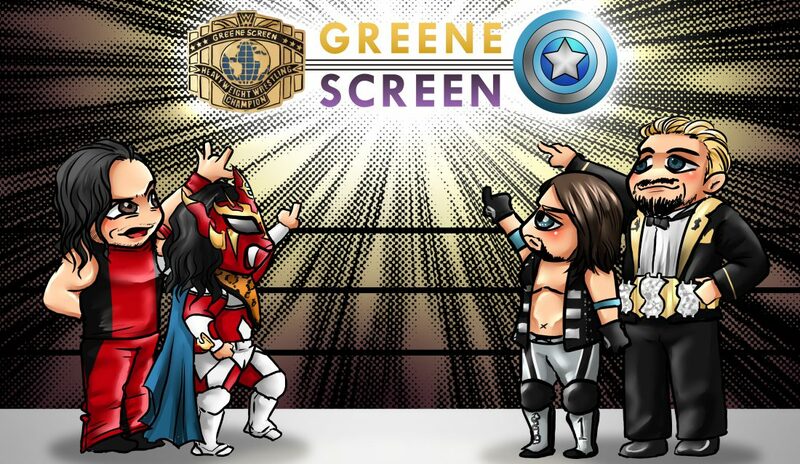 When I asked him for his second favorite encounter, he said it was the Iron Man match with Shawn Michaels at WrestleMania 12. According to Bret, both Michaels and Smith were out of shape for their respective matches and he had to carry the bulk of the load. It was evident that he takes great pride in putting on two all-time classics considering the circumstances. 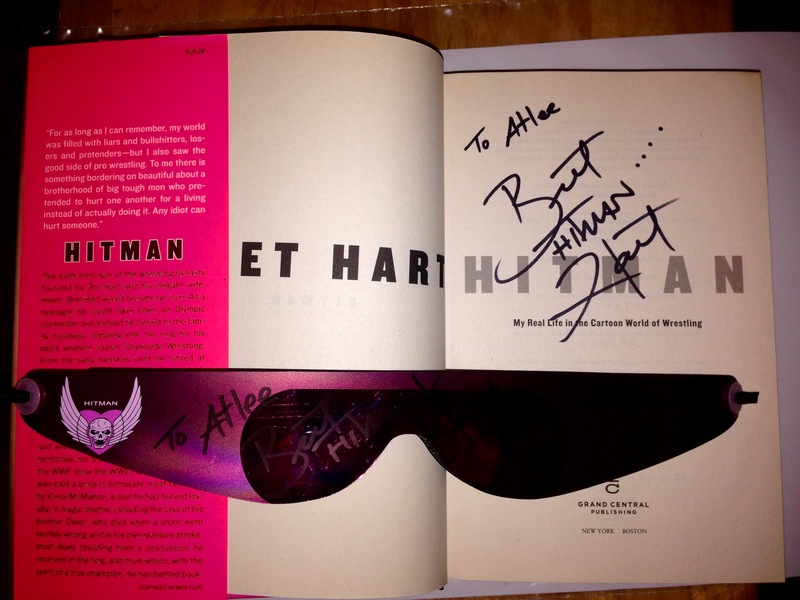 I got his book and the glasses signed. I always wanted a pair of these! “I had no worries because Curt (Mr. Perfect) was a pro and he did me a real big favor by gutting it out and putting me over.” Most of the time, a wrestler needs someone of a high caliber to put them over in a marquee situation in order to become popular with the audience. Mr. Perfect deserves a lot of credit not pulling out of the match and bumping around to the degree that he did. Hart also noted that one of his personal favorites is his match with the Undertaker at 1997 Summer Slam where he won his fifth WWF title. It’s not a bad match by any stretch, but I feel their match at the One Night Only one month later in the U.K. was their best encounter. I really wanted to ask him about it because I knew he felt fondly about the match since it wasn’t commercially released until he requested it to be on his documentary WWE put out in 2005. However, the line was getting longer and I felt that I had taken up too much of his time. I shook his hand, thanked him for his time and for all he’s done in wrestling. Wrestling tales with the Hitman. 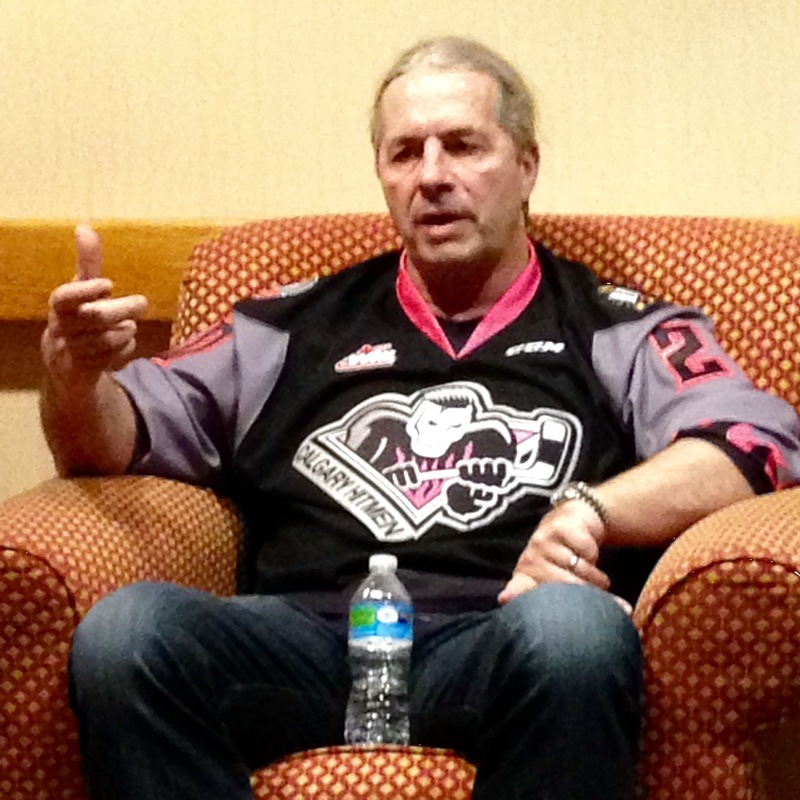 Later on there was a special meet and greet held in an intimate setting where fans got to enjoy a candid conversation with Bret Hart. He was very open about his time and views of the wrestling business. Bret said he never wanted to be a wrestler and only planed on doing it for 3-4 years until he “grew up.” His trainers kept telling him that he was really good and better than his brothers, which pushed him into making it his career. There was also a cool reveal about a feud that never materialized. A cascade of oohs filled the room upon hearing that Hart was scheduled to work a program with Jake “The Snake” Roberts after beating Rowdy Roddy Piper for the I.C. title at WrestleMania 8. Unfortunately, Roberts left the WWF before it began. Near the end of the session there was an eager fan clad in a Wayne Gretzky jersey who took up the majority of the question time. As I stood up to ask my question, the moderator informed the room that there was time for just one more question. This was awesome. I hope I get to meet him one day.